Those awaiting results of February 2016 Real Estate Broker board exam can find here the full list of passers, top 10 (topnotchers), top performing schools and performance of schools as the Professional Regulation Commission (PRC) released results in 5 working days after the exam. PRC on Friday, March 4, announced that 5,499 out of 9,749 passed the Real Estate Broker Licensure Examination. 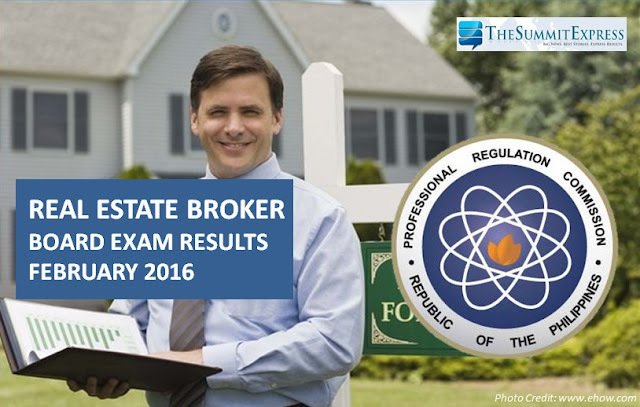 The Real Estate Broker board exam was conducted on Sunday, February 28, 2016 in the cities of Manila, Baguio, Cagayan de Oro, Cebu, Davao, Iloilo, Legaspi, Pagadian and Tuguegarao. Starting March 14, 2016, registration for the issuance of Professional Identification Card (ID) and Certificate of Registration will be done on-line. Please go to www.prc.gov.ph and follow instructions for initial registration. Those who will register are required to bring the following: duly accomplished Oath Form or Panunumpa ng Propesyonal, current Community Tax Certificate (cedula), 1 piece passport size picture (colored with white background and complete nametag), 2 sets of metered documentary stamps, 1 short brown envelope with name and profession and submission of Original Surety Bond, minimum amount of which is P 20,000.00, with the Professional Regulation Commission (PRC)/Housing and Land Use Regulatory Board (HLURB) as Obligee. Ong has confirmed in an event last year that the recent exam was also open not only to re-takers but also to those who undergone the 120-hour Comprehensive Real Estate Seminar (CRES). The Real Estate Broker exams covered the following subjects: general fundamentals of property ownership, real estate laws and taxation, special and technical knowledge and professional practice which includes real estate brokerage practice, planning, development and zoning, basic principles of ecology and appraisal for brokers.